And because of this … we will now get into a spirited discussion in this blog on one of the most contentious topics a New York State resident can postulate. What … constitutes “upstate New York”? See, in reality New York is divided into over 60 counties and boroughs. But we’re really divided into different regions. Buffalo, Rochester – that’s Western New York. Syracuse, Utica – that’s Central New York. Binghamton, Elmira – that’s the Southern Tier. The Adirondacks – that’s Northern New York. Well… first off, New York City ain’t upstate. Let’s get that demarked right now. And although you could make an argument that “upstate” starts once you drive over the Tappan Zee Bridge … that’s really not Upstate. That’s the Hudson Valley. And you still have a long way to drive. Yeah. Saugerties, Woodstock, Harriman, Rhinebeck – that’s the Hudson Valley. No, you don’t truly reach “upstate” until you see the Empire State Plaza on the horizon. 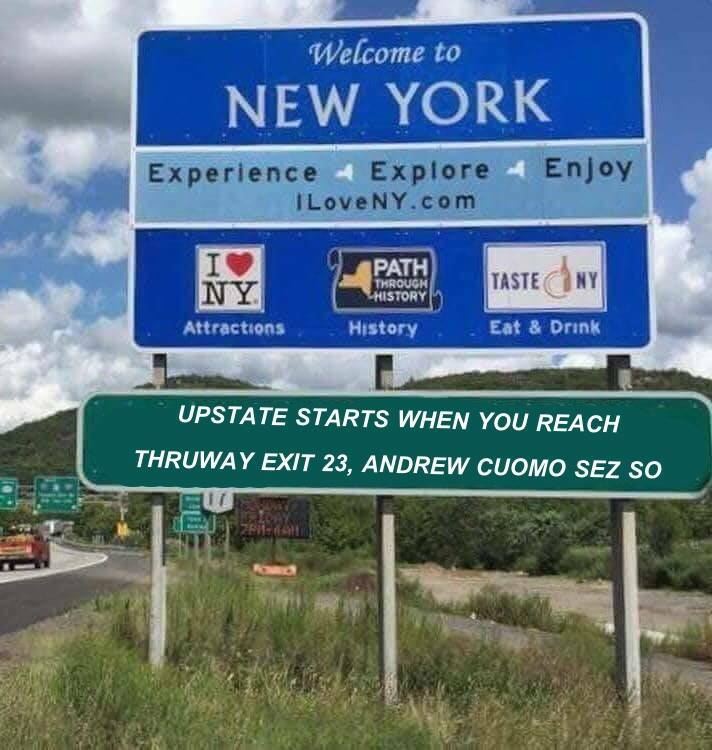 In fact, I challenge Governor Andrew Cuomo to update those “Welcome to New York State” signs to properly reflect where upstate exists. This sign, f’rinstance, would be perfect for those traveling up I-287 from New Jersey. And let’s face it. New Jersey has a line of demarcation – there’s North Jersey, where they call their processed breakfast meat “Taylor Ham,” while South Jersey residents declare it as “Pork Roll.” If you start hearing residents calling the meat one term or the other, you know you’ve crossed the New Jersey equator. So that ends the discussion right there. You people in Dutchess and Ulster and Sullivan Counties – you ain’t “upstate.” You’re in the Hudson Valley and be happy for it. Don’t make me have to drive down to Catskill with a big bucket of white paint and draw a dashed line through Route 9W to delineate upstate and downstate. So as always, I welcome your opinions on this subject. Feel free to add them to the comments section below. I do value all your opinions. Even the wrong ones from you downstaters. I think we need a new “temporary” state commission (headed by a politically connected Surveyor-in-Chief) to spend decades and dollars travelling the state, review census findings, solicit public input from every county, testify before monthly legislative hearings, write up reams of reports – to ultimately draw a squiggly, imaginary, left-to-right line…that pleases everybody. OK, but is western, central NY and the Southern Tier upstate? Or do you have a north/south bias? Just trying to stay on topic: upstate / downstate. Up / down, down / up. North / south, south / north. Greene County is most certainly upstate.